I’m Barb Kemp, creator of the Recipes To The Rescue blog. I’m a food educator with over 15 years of experience, and an enthusiastic home cook. 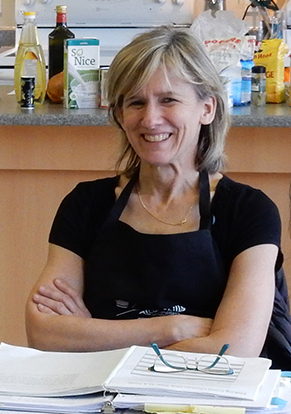 I get very excited talking and teaching about all things food, healthy eating and cooking. My hope is, you too will find the joy of real food and be inspired to join the tribe of life-long healthy and happy home cooks. My love of food and cooking began in my twenties when I discovered my cholesterol level was very high. It was so high I was advised to become vegetarian. The problem was I liked meat and potatoes and didn’t really know how to cook. I was young and ate whatever I wanted, including takeout foods filled with addictive sugar, salt, and fat. Embracing the challenge, I learned to cook with veggies and whole grains and discovered a whole new lifestyle. Later, when I became a mom, one of our children developed a dairy allergy and all meals had to be made from scratch. I struggled at first, but once again welcomed the change and learned to menu plan and cook dairy-free. Eventually, I switched careers and started teaching and writing about the importance of home cooking and meal planning with healthy whole foods. Today, many home cooks lack food knowledge and confidence in the kitchen, as I once did. In some ways, the need to cook is declining, as prepared food is everywhere. Yet for many of us there’s a real desire to cook nourishing meals at home. That’s why I created these online courses. They're enjoyable and relatable for the everyday home cook and teach habits and skills that can easily become part of a healthy lifestyle. Learning the marvels of menu planning and gaining the confidence to cook saved me and my family…and it can save yours too. Join me and together we’ll bring magic into your home kitchen.